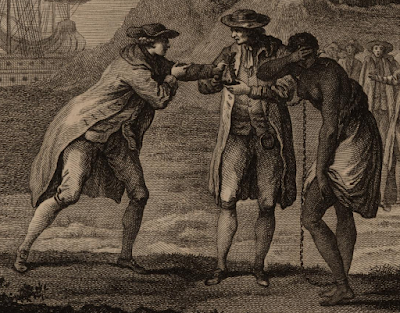 Man sells a slave woman to another, Guillaume-Thomas-François Raynal, 1775, John Carter Brown Library Archive of Early American Images. Un Anglais de la Barbade, vend sa Maitresse, Jean-Michel Moreau, 1780, John Carter Brown Library Archive of Early American Images. These prints relate the story of Yarico. 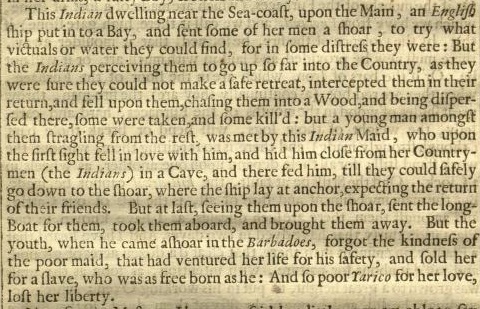 This Indian dwelling near the Sea-coast, upon the Main, an English ship put in to a Bay, and sent some of her men a shoar, to try what victuals or water they could find, for in some distress they were: But the Indians perceiving them to go up so far into the Country, as they were sure they could not make a safe retreat, intercepted them in their return, and fell upon them, chasing them into a Wood, and being dispersed there, some were taken, and some kill'd: but a young man amongst them stragling from the rest, was met by this Indian Maid, who upon the first sight fell in love with him, and hid him close from her Countrymen (the Indians) in a Cave, and there fed him, till they could safely go down to the shoar, where the ship lay at anchor, expecting the return of their friends. But at last, seeing them upon the shoar, sent the long-Boat for them, took them aboard, and brougth them away. But the youth, when he came ashoar in the Barbadoes, forgot the kindness of the poor maid, that had ventured her life for his safety, and sold her for a slave, who was as free born as he: And so poor Yarico for her love, lost her liberty. The story is a difficult one, and the kind that tugged on heartstrings in such a way that the image had some staying power. 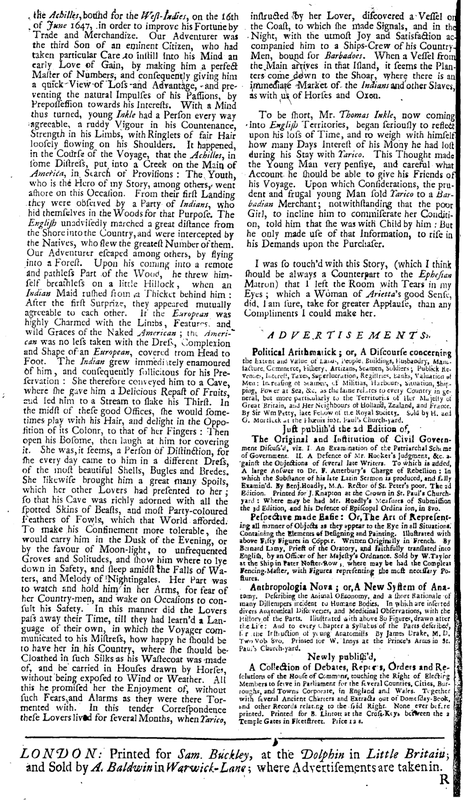 The March 13, 1711 edition of The Spectator included more details to this story, though these were probably fictional embellishments. The unnamed young man is now an overly ambitious Thomas Inkle, whose love of money and advancement outpaced common human decency. Yarico tearfully begs not to be sold, especially as she is bearing his child. Instead of being moved, Inkle uses the pregnancy to demand a higher price from the purchaser. Well more than a century after Ligon published Yarico's tale, it was still being told in Europe. The first two heart wrenching prints come from two different editions the same book, Histoire philosophique et politique des établissemens et du commerce des Européens dans les deux Indes, published in Geneva. In them, the artist relates the image of a sailor handing off a nearly naked woman, chained and collared, to a man with a bag of money. 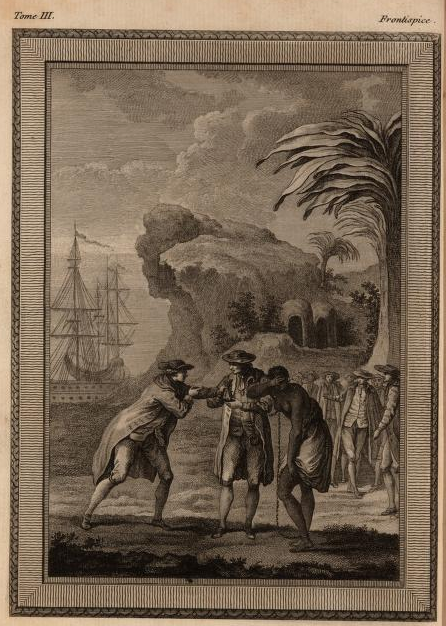 The image was so important to the publishers that both were the frontispiece for Volume 3. In the first, the Inkle is only vaguely reminiscent of British sailors. He wears breeches, a frock coat, and waistcoat, with only the bob wig and neckcloth to give a hint of his occupation. The crowd of men in the background look horrified at the sight, and even the slaver buying Yarico looks a little disconcerted. The sailor lurches forward and clasps the merchant's purse, apparently the only person unmoved by the scene. 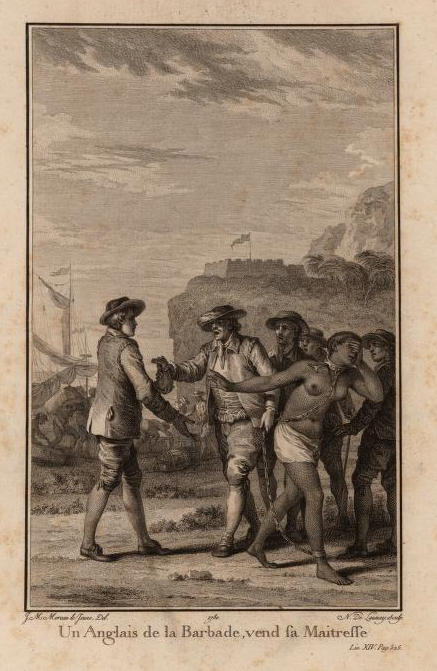 The second version is of a higher quality, and bears the title Un Anglais de la Barbade, vend sa Maitresse (An Englishman from Barbados, sells his Mistress). In this version, the crowd behind the merchant are still upset, and Yarico turns away from her former lover weeping. Unlike many historical prints of the time, this one shows the sailor in clothing reminiscent of a bygone era. The artist gives Inkle a round hat with short brim and conical crown as the only contemporary nod to his profession. Importantly, this print shifts the narrative from Inkle being a heartless villain to a fool. He accepts the purse, but his eyes are fixed with apparent regret on Yarico. 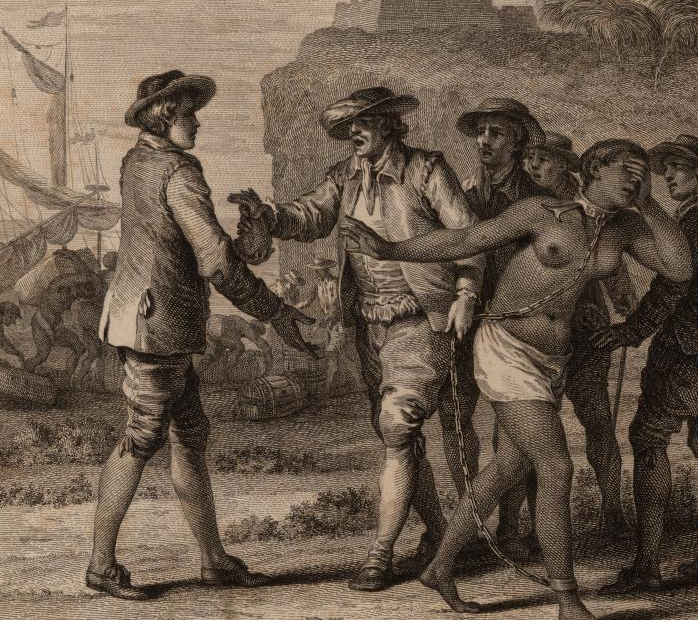 The merchant is the demanding one in this scene, pushing the purse into Inkle's chest with his mouth open around what can be interpreted as a demand. This second version had a greater impact on the late eighteenth century mind. It was reproduced in lower quality, and blatantly copied (with an update to the figures' clothing) for years afterward. Perhaps this messier depiction of Inkle was what inspired the abolitionist opera Inkle and Yarico that premiered seven years later in London, and continued to be performed for decades. In this version, Inkle's regret plagues him, and he eventually recants his ways, sacrificing his life in an attempt to save Yarico after he has condemned her. Versions of it are still performed to this day.